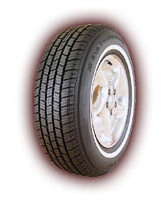 Tread void, created by grooves and sipes, is greatest at the center of the tread to aid traction, then decreased gradually toward the shoulder are for overall, even treadwear. Variable sizing of the gread elements helps reduce noise. Squared off tread elements form an effective pattern of distinct gripping edges for year-round traction. Wide circumferential grooves and lateral grooves promote excellent wet traction by channeling water out from the contact patch.